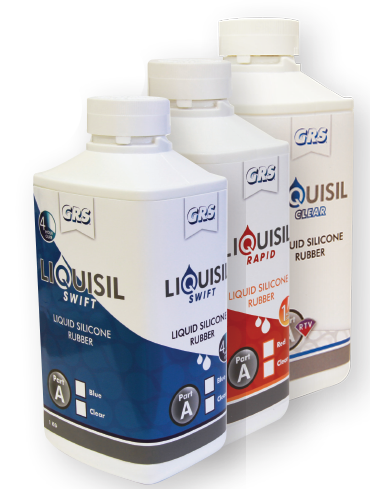 GRS Liquisil is a 2-part RTV liquid silicone rubber that will be ready to cut without conventional vulcanisation as no heat required. Liquisil Rapid cures within 1 hour at 25°C room temperature, Liquisil Swift cures within 4 hours at 25°C room temperature. Liquisil Clear cures within 8 hours at 25°C room temperature and 5 hours at 35°C room temperature. High tear strengths of the mould mean that the RTV moulds are as strong vand as durable as your regular silicone rubber. Liquisil RTV rubber works with all brands of CAD/SLA resin types and with the very low viscosity it is easy to measure, mix and pour into intricate design parts. As Liquisil is fast-curing, your rubber moulds can be injected within the same day as your master is prepared, making it more economical with time than your regular silicone rubber.